Our annual Lenten Lunch & Learn series begins on Tuesday, March 12 and will continue each Tuesdays from 12-1 PM in the Fireside Room through April 9. Join Pastor Dave for this five week series titled, “Barriers to Forgiveness.” Come and see how God provides forgiveness to us and how we are to extend this gift to others, even when it is extremely difficult. Lunch will be free and this class is open to all. 1. Our Grief Support Group meets the first Wednesday and the third Tuesday of each month at 10:00 AM and provides help, hope, and healing to those dealing with grief and loss. 2. Our RLI Group deals with “Real Life Issues” and meets the second Wednesday of every month at 10:00 AM This group meets to discuss issues pertaining to end of life, death and dying, and spiritual questions. Both groups are open to anyone in the church and community and maintain a high level of confidentiality. Both of these groups meet in our new conference room. For questions about any of these support groups, please talk with Dr. Don Harr or Pastor Dave. Dr. Harr is a retired psychiatrist with a lot of years of experience in helping people cope and grow through their loss. Time & Talent Fair was wonderful. Thanks to all who donated and purchased items at our annual Time and Talent Fair on Sunday, November 10. Over $2,500 was raised for Habitat for Humanity from this special event. 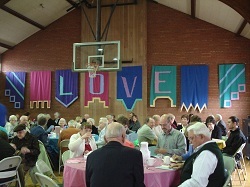 5th Annual Youth Pie Auction was Big Success: The youth group raised just over $4,100 at our 5th annual pie auction and lunch following worship on Sunday, October 16. Funds raised go to help cover the costs of retreats, mission trips, and other special events. Special thanks to all who donated! In this picture Heather is giving Pastor Dave a face-ful of pie. Community Block Party Appreciation: Thanks to the many people who made our annual community block party in August a great success. About 300 people attended and enjoyed a great evening of free food, large inflatable games for the kids, music, and fun. We plan to make this an annual event so your help next summer in making this an even bigger and better event would be greatly appreciated. One Great Hour of Sharing Offering was Huge!! Thanks to all who participated in our One Great Hour of Sharing fishing derby. This year's goal was to collect 200 pounds of fish. No only did we meet our goal, we shattered it as 415 lbs. of fish were returned. WOW!! The amount of coins inside the fish totaled $3,200. Our church's mission committee added this amount, bringing our total offering to over $5,000. This money will go to help those in need. Thanks to your generous support of this special offering that is received every Easter. Growing in the Spirit: Women's Retreat was a great success. On Saturday, April 20, 33 women met at Eagle Rock Sanctuary for a day long retreat. The Retreat "Growing in the Spirit" was led by Rev. Marcia Muir, former member of First Presbyterian Church, Billings. She is now serving a church in Yuma, Colorado. The ladies enjoyed a time of learning about the Holy Spirit, and then shared their ideas with words about the Holy spirit on a vine covered with leaves and flowers. The visual demonstration was quite colorful and effective. The Holy Spirit was alive and well in the midst of this time together. 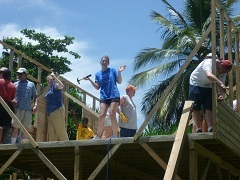 Summer 2012 Mission Trip to Belize, Central America was incredible! 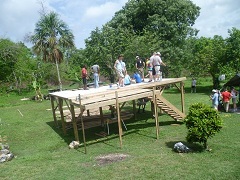 26 youth and adults from our congregation traveled to Belize and built a home for a very poor family. It was a life changing experience as we were able to share with others the love and grace of Jesus Christ. 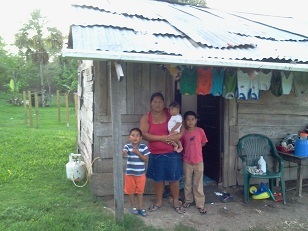 Thanks to many who supported this trip, both prayerfully and financially. 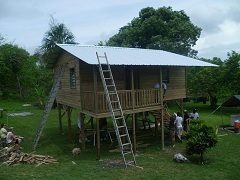 The mission team will be sharing of their Belize trip during worship on Sunday, August 12 at 9:30 AM. 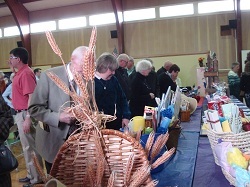 Over $8,300 was donated to youth mission trip to Belize though the 13th annual gift basket auction on Sunday, March 25. Thanks to all who donated baskets, purchased baskets, and helped with the wonderful meal. What a generous congregation! !